The Dong minority is one of the 56 ethnic minority groups that reside in China. 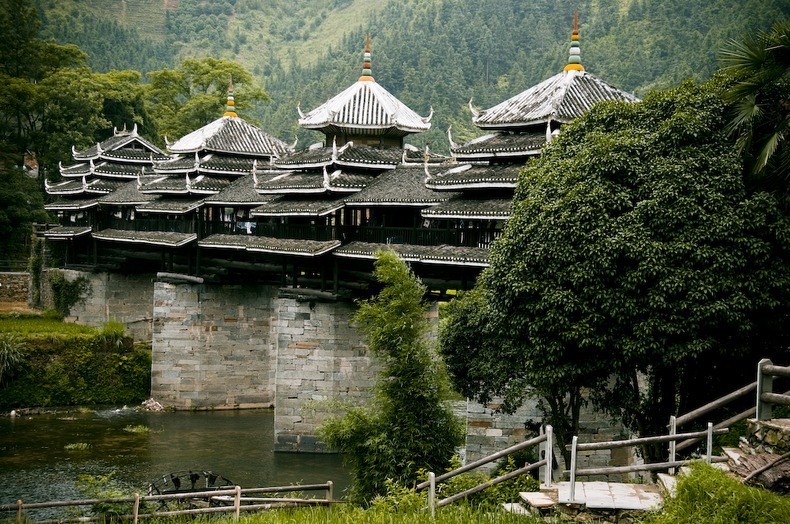 The Dong people live in scattered villages in China’s Hunan, Hubei, Guizhou and Guangxi provinces where they are famous for their traditional sweet rice and for their unique carpentry skills which they display by constructing beautiful wooden covered bridges. These bridges are called "Wind and Rain Bridges" because there are pavilions built on the bridge that provide shelter to people from the wind and rain. These bridges have also earned the name of "flower bridges" because of their exquisite architecture. On a raining day, the pavilions on the bridge provide locals an excellent place to meet, relax, socialize, exchange ideas, and even amuse.